Right in mid-throw the auger stopped turning on my 5 HP MTD model 313-610E snow blower. The engagement cable seemed fine, so I turned my troubleshooting eye on the auger belt. Parts and materials: Replacement belt. Repair shop cost: Maybe $30 but there will be hauling costs also. 1) Remove the belt cover. Remove the two machine screws holding down the plastic cover on this machine. The belt has come off. It is worn out and must be replaced. 2) With a screwdriver take the belt off the large lower pulley. 3) Use a small crowbar to push a large spring loaded plate toward the engine. This is necessary to provide clearance to pull the belt up and over the pulleys. 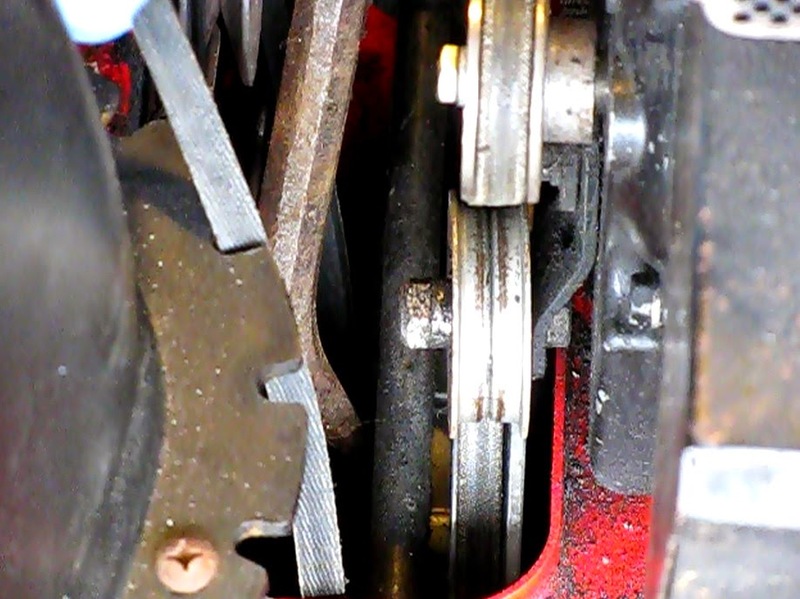 1) Slip the belt down until it stops at the black spring loaded plate between the pulleys. 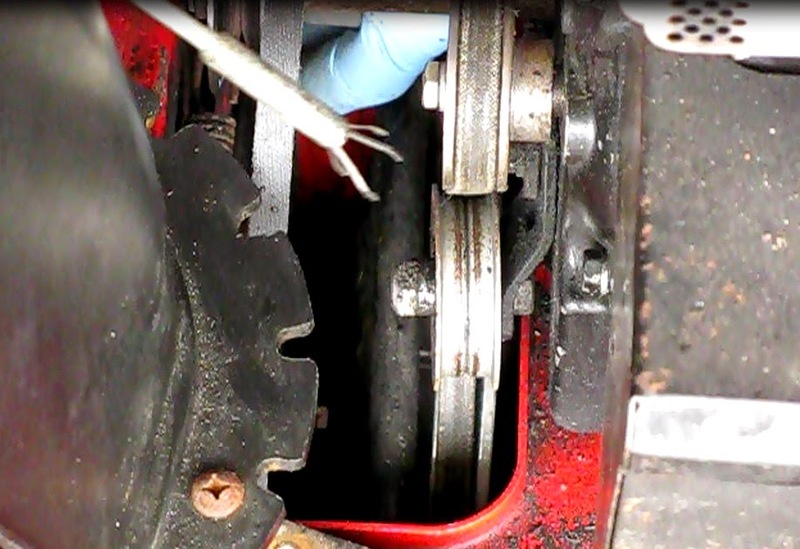 2) With a crowbar, retract the plate toward the engine and use a large screwdriver to push the belt through the gap. 3) Seat the belt under the pulleys. A flexible grabbing tool will be a definite help here in placing the belt under the pulleys. A long screwdriver can be used with time-consuming results. 4) Remove the spark plug wire for safety. We will be turning the motor shaft just a bit. 5) Start to seat the belt over the top of the upper engine drive pulley. 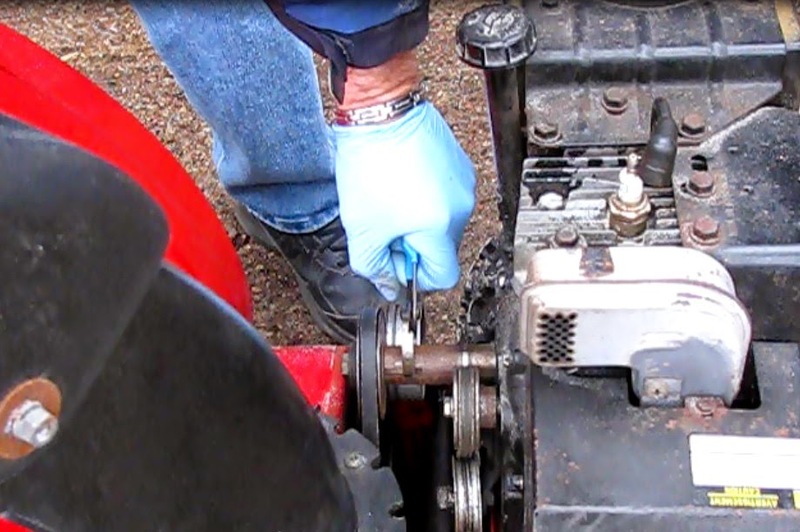 Turn the shaft of the engine until the new belt is fully seated on the pulley. Seating the belt fully around the main drive pulley. Note the spark plug wire is off. 1) The auger cable may not need adjustment, but at least check it. If it’s too tight the life of the belt may be shortened. It should be just pulled taut when the auger lever reaches the handle. 2) If adjustment is needed, loosen the locknut on the turnbuckle adjuster and loosen the long adjuster. Tighten the locknut. 3) Re-install the belt cover and go throw some snow. 1) you dont need to use crowbar to push back plate. It will move by itself once you zip tie the drive lever to the handle. 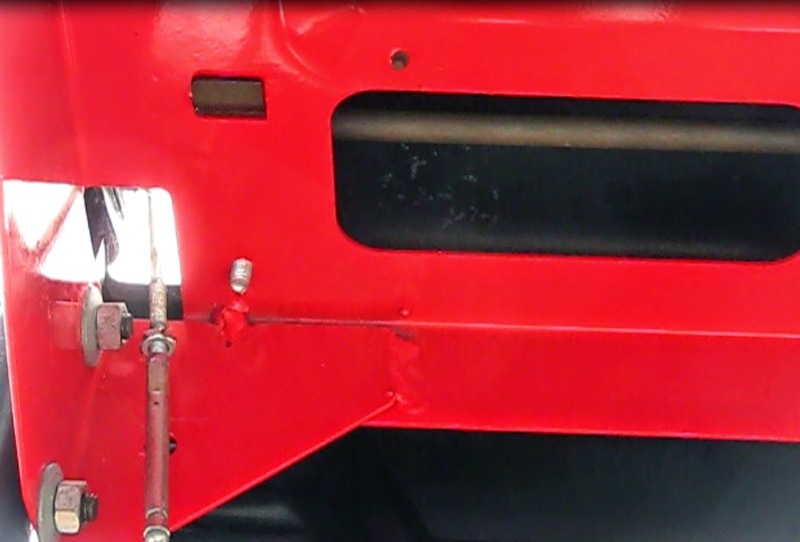 2) the MTD Yard snow blowers have an auger belt "guide" at the bottom of the large pulley. You make it seem that you can simply apply belt to bottom of pulley from the top access point. The reality is you also need to remove the lower plate of blower to access the "guide". By zip-tying the auger lever to the handle, the "guide" will pull away enough from the pulley to allow you to place belt between "guide" and pulley. That's a good idea, using the zip tie. I had one of those, "Why didn't I think of that" moments! As for the belt guides, my machine (model 313-610E) didn't come with those. I've changed the auger belt several times using this method, although the manual does direct to drain the gas, tip the machine, remove the bottom plate, a spring...I'll stick to my way. It may not work on all machines though. Thanks for the comment!